VLOV Spring / Summer 2012 is inspired by the letter V, for graphic and graceful simplicity. The collection incorporates laser-cutting techniques, finish on high tech wool, creased linens and embossed fabrications. The palette consists of white which represents hope, grey for introspective elegance, blue and black. 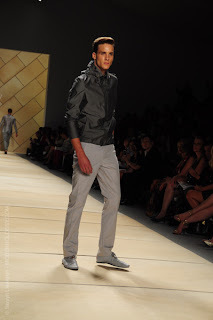 My favorite looks are the grey pinstriped cotton hooded jacket with light grey cotton pants and the grey wool jacket, black knit V-neck and black wool pants. There are a few zip jackets, 3/4 sleeve jackets as well as elastic cuffs on jackets and pants in the collection. What I really loved were the leather shoes, which look incredibly comfortable!